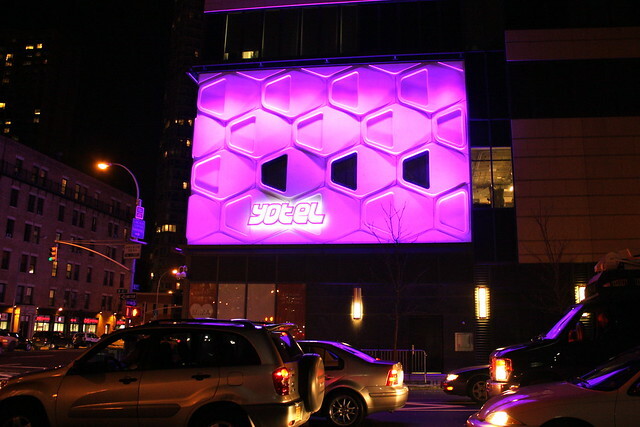 A long time ago, at jobs now far far away, Rich and I bought a Groupon deal for a night in the Yotel in Midtown Manhattan. Last Saturday we spent the night in our tiny "cabin" with nooks and crannies for everything you could think of high above the city. A bit of a belated Valentine's Day celebration, but also a chance to play tourist in New York. Saturday afternoon sunshine with a beer, cheers! I was a bit disappointed at check in that there wasn't an ACTUAL robot to check us in. There was a robot, but I think it was just for show. I was expecting something a little more Jetson-ish, but it was just a computer screen. Two elevator rides later we got to our room on the 24th floor looking down over the city. Inside the room its very small, and everything is compact or folds away into tiny nooks and the bed folds into a couch to create more space. The bathroom was really modern with lots of glass and curtains separating it from the main room, but it let in all the light from the giant window. I was delighted with how charming, cozy and modern it was. It's how I imagine cool hotels in Japan would be. 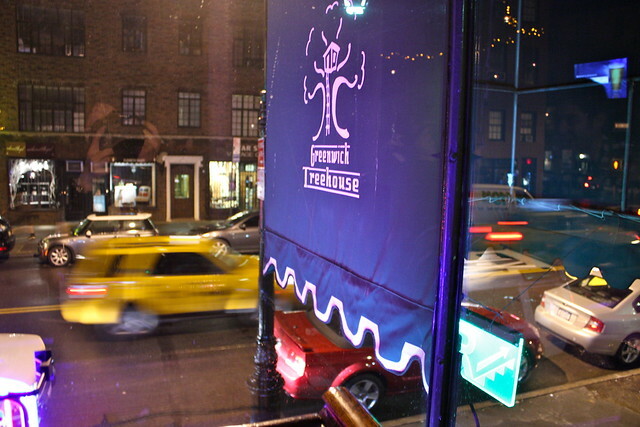 There was an hour long wait at the Meatball Shop where we went for dinner, but we were told to expect that. If you ever go to the Meatball Shop (any location) make sure you have a place to hang out for awhile because its so popular. I was dying to eat something, but also dying to try the famous balls so we walked a few doors down to the Greenwich Treehouse to wait it out. The bar is placed just high enough above the street that you can sit at a long bar and watch everything just above the heads of passerby's. We watched some crazy guys fake fight across the street at another bar, cabs zoom by and cute dogs out for an evening stroll. Finally we arrived at the famous Meatball Shop and circled our orders on the menu. 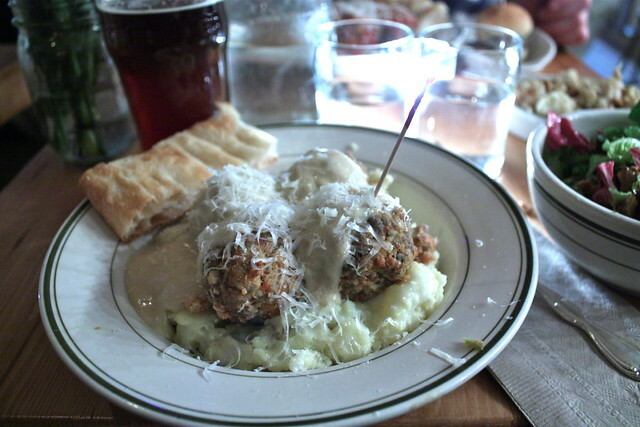 I got the beef balls with parmesan cream sauce on mashed potatoes with a sunchoke salad on the side. Completely divine. After dinner we hopped in our bubblegum pink Mini Cooper stretch limo...no just kidding. We had to walk off all the food we ate so we took the subway up to Times Square and walked past the New York Times building where we saw this crazy car. Can you guess who it was? 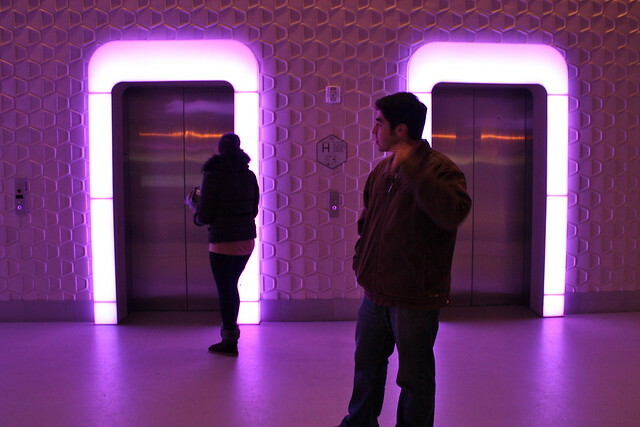 Taking a detour around the crowds in the area we arrived back at Yotel. We meant to go upstairs and grab warmer clothes so we could walk over to another bar but I was so sleepy and full that we never made it. Even so, it was a perfect night. How cute, the dress with the Converse Hi-Tops! 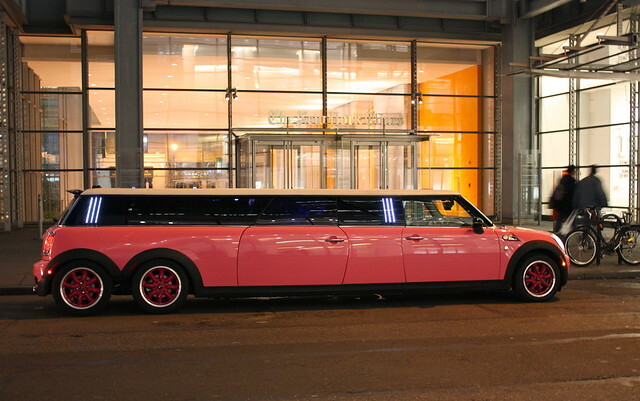 Okay, so, there are few people that I know who would have a stretch Mini Cooper limo in Pink Bubblegum colors. Nicki Minaj? Paris Hilton (is she still relevant)? Katy Perry? I give up. 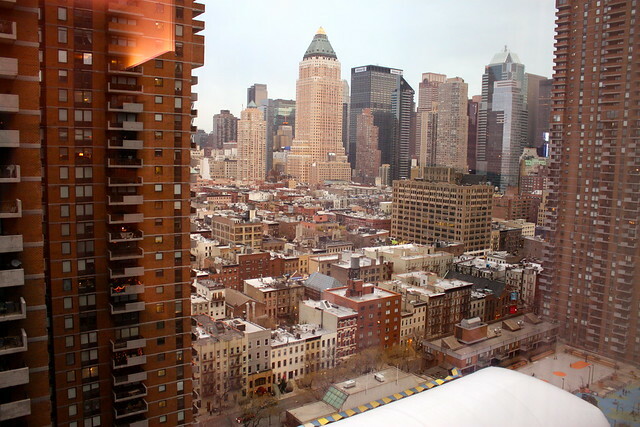 I want to so badly go to New York! I totally thought Nicki Minaj haha! Oh my goodness Kallie the comments you left on my blog-- after I read one I did this thing where I slapped my hands (which didn't hurt, considering my sweater is two sizes too big and the sleeves droop over my hands) and laughed while I cried simultaneously and then I squealed like a toddler. And then I read the next one and I repeated the process. Made my day beyond comprehension. Thank you so much. I am so incredibly flattered and I think I need to take a bath to calm down right now. How cool! What a great choice and way to enjoy the city. That Mini Cooper stretch is making me gigle non-stop. omg wish i lived in ny so my groupons could be this sick!! I love Yotels! 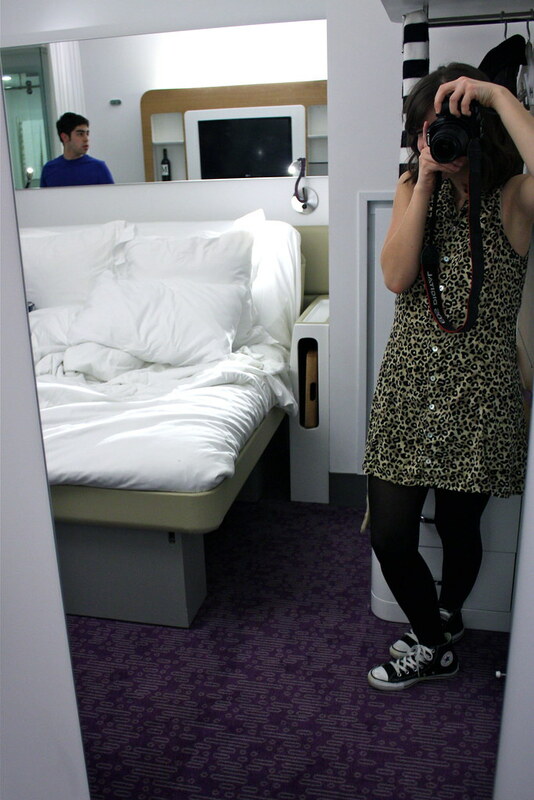 I stayed in the Amsterdam airport one twice last summer, and while it only allowed me to be a tourist in the airport, even that was pretty fun! ; ) I love being a tourist in my own town and in New York it must be extra-special.